Cloud has been the buzzword for a while now, and it’s something that every vendor and technology tries (sometimes desperately) to attach itself too. That’s also the reason why it can be a little difficult to see through the proverbial smoke that is being blown. It’s also another great example of a consumer trend that has forced its way into Enterprise IT. This year we’ve seen some pretty tangible examples of ‘Cloud’ becoming a part of day-to-day End User Computing from the three big vendors we deal with the most in End User Computing (on the desktop virtualization side). As a company, VMware is all over Cloud, but this really didn’t materialize in VMware End User Computing product offerings until about a year ago. It could be said that VMware started it with VMware Horizon Air late in 2014 but that really was only a variation on Horizon DaaS (from their Desktone acquisition). Going on a tangent for a bit, personally, I think that (pure) DaaS isn’t going to have a big impact in End User Computing market in the near future because of the problems of the application and data locality for most current enterprise End User Computing environments. As the application landscape changes this ‘problem’ will gradually fix itself, serially, over the world over the next 3-10 years but for the time being we’re still faced with the fact that many Enterprises great and small still have to deal with applications and data that are bound to their local data centers. Given Microsoft's strategic bet on Azure it was only a matter of time before this would have a large effect on the part of Microsoft that we deal with a lot: Remote Desktop Services. In late 2014 / beginning 2015 Microsoft made available Azure RemoteApp (ARA) which focuses more on an “application” play (vs. a full “Desktop” as-a-Service), but under the covers is RDSH in Azure managed by Microsoft with cloud-scale and the Azure management capabilities and ease of use. Over the year we’ve seen Microsoft make many incremental improvements to the service (one of the key Cloud benefits) making it more and more valuable to their customers. In some ways you could think about ARA being the future of RDSH, especially when you consider Microsoft’s drive for “Windows as a Service,” or continuous delivery direction. One thing that ARA doesn’t deliver, however, is a hybrid ability–meaning that you can manage your on-premises RDSH deployment as well as your Cloud (Azure) hosted RDSHs. This hybrid approach is something that both Citrix and VMware are both very serious about. Citrix was the first to market when they released Citrix Workspace Cloud (CWC) a couple of months ago. In many ways Citrix Workspace Cloud represents the future of the core Citrix products (which has became even more apparent with the big changes in their business strategy Citrix recently announced). VMware is not far behind because they are getting ready to release Project Enzo early next year. 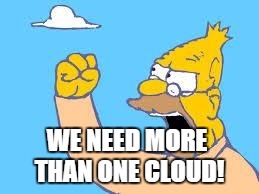 Since all of these Cloud products from the main vendors are relatively new, I think next year we will start to see the big uptake and quick incremental updates and changes (to pricing for example) as Enterprises start to use these new technologies. I think that a key factor for success for these vendors is just how good their hybrid capabilities will be–combining cloud based desktop virtualization, on-premises desktop virtualization but also, maybe even especially, good old physical desktops (you know, the other 90% of the End User Computer market). Success and adoption will also depend on how well these offerings integrate with existing deployments (equaling dollars spent) which is especially important for Citrix who have deployments in almost every enterprise. It will also be important to see how the different vendors support the major public clouds in these offerings. It seems VMware and Microsoft will focus on their own public cloud(s) first, where Citrix is more focused on “any cloud” (their words, not mine). Overall, the hybrid capabilities of these offerings are going to be key, especially in the first year(s) of these products entering the market. Getting the right blend is not going to be easy but whoever gets it right will be in the fast lane.